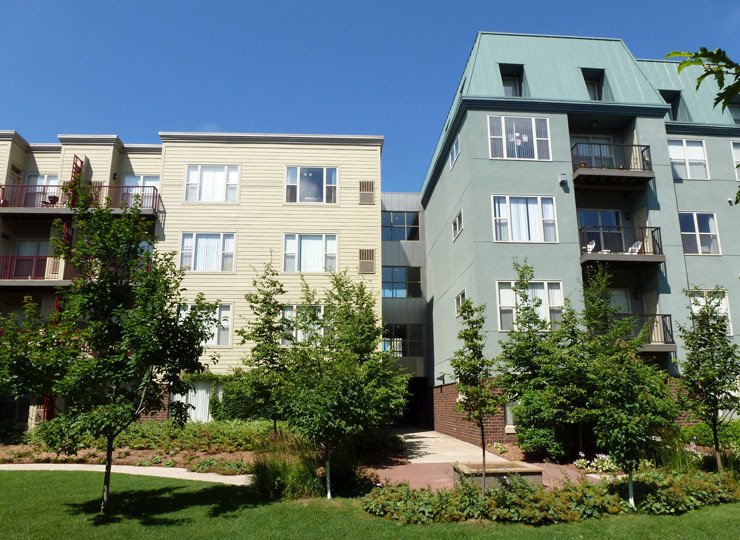 Fiber cement cladding has found wide acceptance as a durable and renewable material. Since entering the U.S. market in the early 1990s, assumptions on its long-term resiliency have relied heavily on wet/dry cycling tests, but little is reported on its durability under typical in-service conditions. Here we describe four stages of fiber cement degradation under intended weathering and design conditions. Although simplified, we offer an objective description that is consistent with the terminology and assumptions applied by the fiber cement industry. We reconcile these assumptions with observations made over the course of 15 years, which indicate that lifespans of 20-30 years are unlikely using current design and construction practices. Fiber cement is a composite manufactured from slurries of portland cement, sand, wood fibers, and water. The type of fibers, together with their composition and orientation, are important as these characteristics give the composite its mechanical properties. Kraft wood pulp is preferred as kraft pulping largely removes alkaline-sensitive lignin, resulting in fiber compositions rich in cellulose (70-80%) and hemicellulose (20-30%). Manufactured products such as panels, planks, or shingles are formed by sequentially layering multiple thin films. Although manufacturing processes vary, these films represent heterogeneous matrixes having one side that is fiber rich and the other that is fiber poor. Bonding characteristics between laminates play important roles in the materials’ durability and in-service performance. Formed sheets are either air-dried or autoclaved for the purpose of curing and moisture removal. The preferred method of autoclaving aids in the reaction of sand with calcium hydroxide to form calcium silica hydrate. Improved hydration gives autoclaved fiber cement greater strength, but may also increase susceptibility to chemical attack, moisture movement and subsequent thermal-moisture stressing. Magnified View of a Typical Field Cut. Finished products may be either pre-primed or unprimed. It is important to note that coverage of pre-primed surfaces may vary, resulting in uneven protection. Fibers and matrixes may be further exposed through minor cracking, abrasion, and field cuts. Manufacturers’ requirements for caulking or priming damaged surfaces are poorly achieved under routine installation practices. 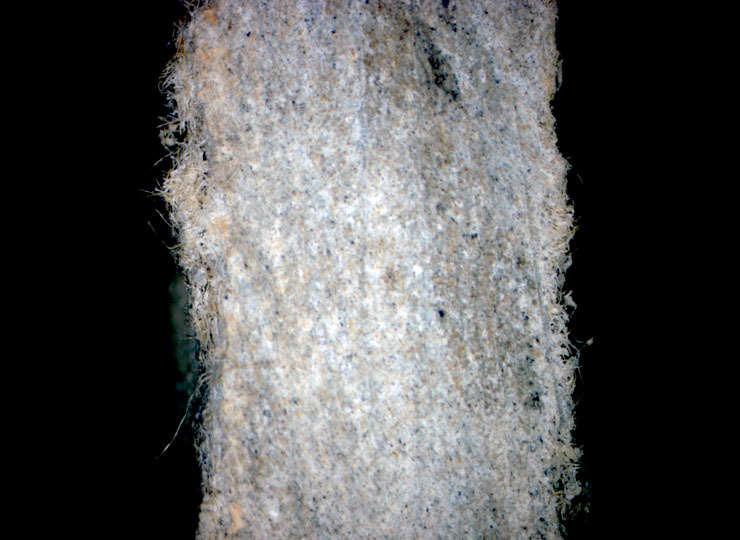 These exposed fibers create important pathways for moisture absorption, freeze-thaw damage, and fungal colonization. While they may span relatively small areas, these unprotected surfaces can significantly reduce the material’s overall durability even in the absence of extreme moisture or other deleterious agents. This discussion is limited to degradation patterns of medium-density composites, which have a density range of 1.2 to 1.6 g/cm3. High density composites are manufactured much in the same way as medium density products; however, laminates of the former are compressed to desired thicknesses to achieve densities ranging from >1.6 to 1.9 g/cm3. Increased density imparts greater strength, stiffness, and moisture resistance for much improved in-service performance. Degradation patterns under normal weathering are described below. Weathering is defined as the change in material properties as a result of time and exposure under intended design conditions. The effects of weathering will vary greatly with differences in manufacturing techniques, climate, assembly design, installation methods, and maintenance. In-service performance may therefore deviate from the characteristics and timeframes described below. Fiber cement is subject to many of the same processes as other cement-based materials. One of the more important processes is carbonation, which results from the exposure of calcium-based phases of the cement component to CO2 in air and water. Carbonation of the matrix increases flexural strength through improved bonding between the laminated films. As the product enters its second year of service, the degree of inter-laminar bonding may be countered by thermal and moisture stresses. Although carbonation initially aids in inter-laminar bonding, carbon reactions with hydration products may also serve to increase moisture movement, which compounds the effects of thermal and moisture stresses. Weathering results in repeated cycles of moisture movement that ultimately serve to disrupt the cementitious matrix and reduce inter-laminar bonding. By moisture movement, we refer to shrinkage and expansion due to the entry of water into and out of the pulp fiber. Through continued thermal and moisture cycling, the matrix-fiber interface becomes disrupted, ultimately reducing bonds between laminates and individual fibers. Further debonding results in partial delamination; albeit scarcely perceptible to the naked eye. Also, at the molecular level, cellulose and hemicellulose are altered by atmospheric oxygen, alkali attack, and early biological degradation by fungi and other microorganisms. Much like incipient decay of wood, this stage of degradation lacks softening, evident delamination, cracking or other signs commonly recognized as degradation. Physical and mechanical properties are nonetheless affected, and it is reasonable to assume a minimum 10% reduction in strength at five years. 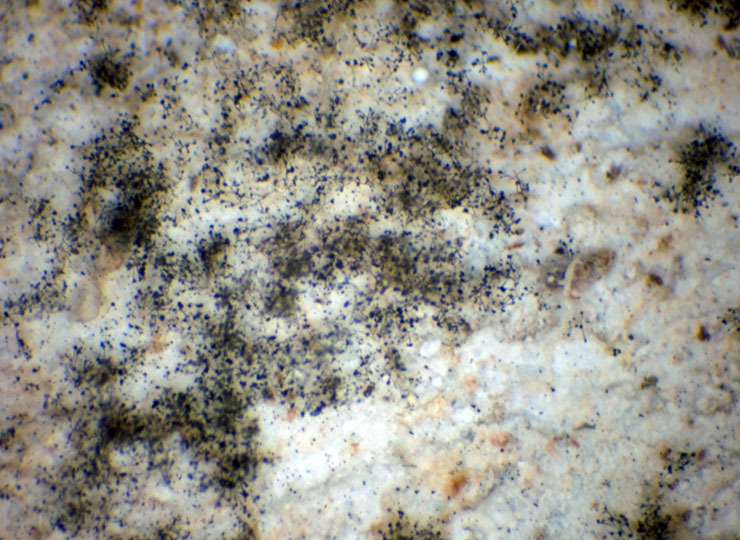 Fungal Growth on Fiber Cement. This stage of degradation is marked by near complete carbonation of the cementitious matrix. It is a pivotal time in the product’s service life. From this point forward, the material will experience significantly greater moisture movement, increasing the likelihood of freeze-thaw damage, matrix degradation, cellulose depolymerization, debonded fibers, and delamination. The material’s vulnerably to biological attack is high. Achieving the assumed service life of 20-30 years is now very much dependent upon future moisture loading within the material and its adjacent assembly components. Designed and installed conditions, together with future maintenance practices, will determine the material’s fate. Visible effects vary but may include softening, chipping, cracking, early delamination, peeling paint, poor acceptance of new coatings, and fungal growth. The material’s strength can be reduced by as much as 40% from as-manufactured conditions. At this stage, composite degradation is near complete and the product is now at the end of its serviceable life. Disrupted matrixes, cellulose depolymerization, and delamination are pervasive. Strength is now at half of as-manufactured conditions. Exposed surfaces may show matrix sloughing, material loss, extreme delamination, cracking, and softening. 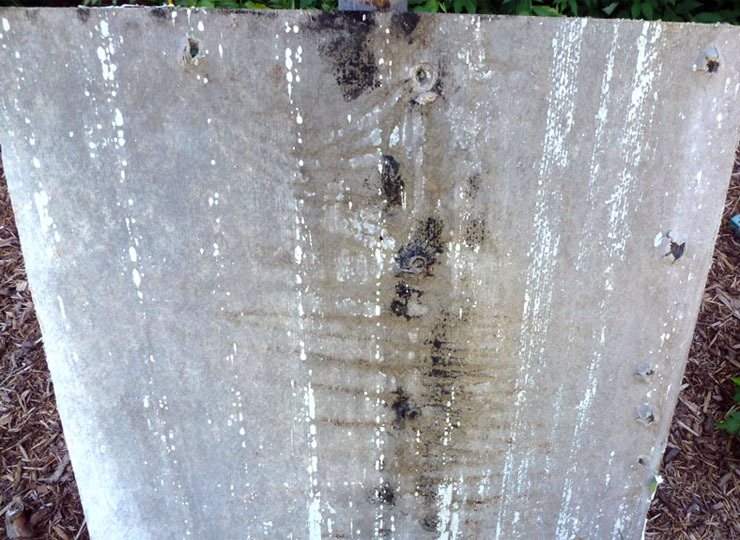 Advanced degradation is usually accompanied by visible fungal growth, which can be profuse – particularly on concealed surfaces subject to poor drying. Being comprised largely of cellulose and hemicellulose, fiber cement may give rise to rich fungal assemblages that include common species of Aspergillus, Penicillium, Stachybotrys, Chaetomium, Aureobasidium, and Acremonium. Degradation of Fiber Cement Siding. 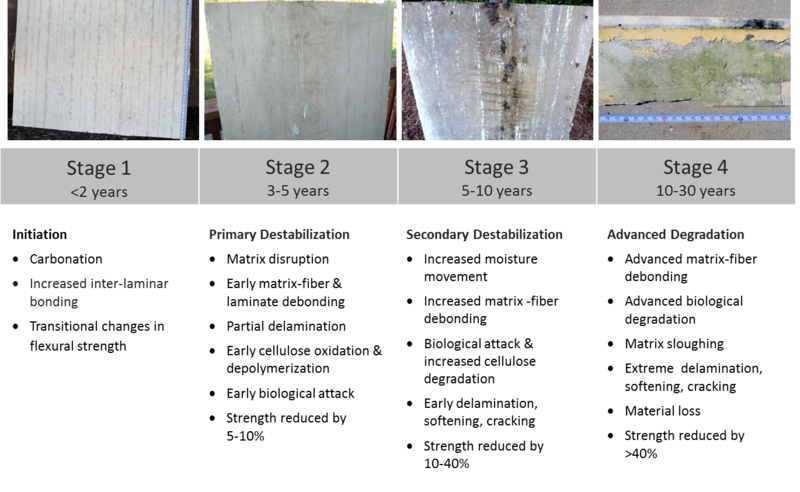 Field observations of products in service for 5 to 15 years indicate degradation characteristics consistent with Stages 3 and 4 for vertical siding and Stages 2-4 for lap siding. Reduced service lives of 10 years or less are common. In many of these instances, installed conditions are substantially compliant with manufacturers’ requirements. Examples of such risks include materials prone to back-splashing, snow coverage, or inadequate drying (e.g. lack of rainscreens). Equally important is the fact that installation requirements change over time. This moving target affects performance assumptions regarding previously installed materials. For example, after a decade of service without rainscreen requirements, James Hardie now mandates a minimum 3/8” vented rainscreen for its fiber cement vertical siding (see James Hardie’s Technical Bulletin #18). This new requirement applies only to vertical siding panels when used in “commercial, multi-family or construction greater than 2 stories”. In-service performance of decade-old materials installed without rainscreens, or applications outside the applicable building types, should be justifiably questioned. Degradation Sequence. Click to Enlarge. Fiber cement resiliency under normal weathering demands critical re-examination. Absent of other major agents, moisture and freeze-thaw cycling remain the primary determinants of durability. Service lives in excess of 20 years demand very robust assembly designs as well as construction practices that exceed manufacturers’ requirements. Expectations of durability also demand better understanding of the material’s inherent vulnerabilities so that assemblies may retain resiliency despite shortfalls in cladding performance. ASTM C1185. Standard Test Methods for Sampling and Testing Non-Asbestos Fiber-Cement Flat Sheet, Roofing and Siding Shingles, and Clapboards.